Snippets of Jack: "There'll Be No Knowing Here"
"There'll Be No Knowing Here"
Now that Jack and his crew are same on board the Black Pearl, Jack's next obstacle is avoiding the kraken and Davy Jones. He leads the crew inland, into the swamps. Will gets rather suspicious of Jack's behavior though. Will: "Why is Jack afraid of the open ocean?" Gibbs: "Well, if you believe such things, there's a beast that does the bidding of Davy Jones. A fearsome creature with griant tentacles that'll suction your face clean off and drag an entire ship down to the crushing darkness. The kraken. They say the stench of its breath is like . . . Imagine, the last thing you know on God's green earth is the roar of the kraken and the reeking odor of a thousand rotting corpses." Oh, I might just take the cannibals instead! Gibbs, who realizes that he just disturbed everyone on the row boat, continues, "If you believe such things." Will: "And the key will spare him that?" Gibbs: "Well, that's the very question Jack wants answered. Bad enough even to go visit . . . her." Will: "Her?" Gibbs: "Aye." They pull up to Tia Delma's shack But by now they're all scared so Jack "reasures" them. Jack: "No worries mates. Tia Delma and I go way back. Thick as theives. [Where have I heard that before?] Nigh inseparable, we are. Were. Have beeen. Before." Gibbs: "I'll watch your back." Jack: "It's me front I'm worried about." Now suddenly all of the crew wants to go inside to see what happens, but somebody has to watch the boat. So of course, they make the person who can't object do it: Cotton. 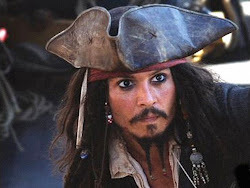 Tia: "Jack Sparrow." Jack: "Tia Dalma." He nearly bonks his head on the jar of who-knows-what. Tia Dalma: "I always knew the wind was going to blow you back to me one day." Jack smiles at her, but he's still slightly creeped out by the strang concoctions all over her house. Tia Dalma turns her attention to Will though. Tia: "You . . . you have a touch of . . . destiny about you, William Turner." Will, who has nevery seen this bizzare woman in his life, is a little shocked that she knows his name. Will: "You know me?" This also puzzles Jack a bit. Tia Dalma: "You want to know me." Jack: "There'll be no knowing here. We've come for help and we're not leaving without it. I thought I knew you." Jack is getting slightly jealous. Tia: "Not so well as I had hoped. Come." Jack: "Come." Tia Dalma continues to hit on Will: "What service may I do you?" Then she yells at Jack: "You know I memand payment." Jack: "I brought payment. Look. An undead monkey. Top that." Tia Dalma seems content, and lets the monkey out of its cage. Gibbs: "Don't! you've no idea how long it took us to catch that." Tia Dalma: "The payment is fair." Will cuts right to the point: "We're looking for this. And what it goes to." Tia Dalma: "The compass you bartered from me, it cannot lead you to this?" Jack: "Maybe. Why?" Tia Dalma can see right through him: "I hear you. Jack Sparrow does not know what he wants. Or do you know, but are loath to claim it as your own?" Jack just blows on a string hanging from the ceiling. Tia: "Your key go to a chest. And it is what lay inside the best that you seek, dont' it?" Tia Dalma just has really great grammar, don't she? She then shares with great grammar what happened to Davy Jones and why his heart is hidden the this chest, as Jack steals a few things around the hut. Davy Jones, who used to be a good person and sailor, fell in love with Calypso, the goddess of the sea. But it was too hard for him to leave her for ten years to sail the seas, so he did what thought was the only option for him. He cut out his heart (yes, his actual heart, not "figuratively") and put it inside the chest. For some reason this story greatly intrigues Will. Cutting out his hear and locking it up seems to have some kind of effect to him. I wonder why . . . Could it be this touch of destiny? Tia Dalma: "The key he keep with him at all times." Will to Jack: "You knew this." Jack: "I did not. I didn't know where the key was. But now we do. All that's left is climb aboard the Flying Dutchman, grab the key, you go back to Port Royal and save your bonnie lass." Will, thinking of his love for a young lady, gets back to the point. Will: "It seems we have a need to find the Flying Dutchman." This makes Tia Dalma very pleased. Tia: "A touch of destiny!" Where do you think this destiny will lead him?